It was a tale of two powerplays as Northamptonshire eased past Worcestershire, with Richard Gleeson’s three-wicket burst with the ball, before Richard Levi and Adam Rossington virtually ended the chase inside six overs with the bat. 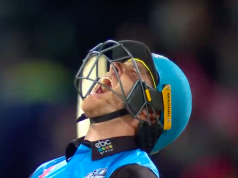 Gleeson had a breakthrough campiagn last year, but hadn’t taken a wicket in this year’s Blast. Tonight removed Joe Clarke, Ben Cox and John Hastings, all bowled, as the visitors stumbled to 35-3 from six, Gleeson finishing with superb 3-12 from his four overs. Brett D’Oliveira’s half century saw the Rapids recover to 158, a total that looked competitive on a slightly two paced Wantage Road wicket, but Levi and Rossington racked up a remarkable 78 in the powerplay. Although the Steelbacks slightly wobbled after, skipper Alex Wakely and Rob Keogh showed cool heads with an unbroken stand of 66, Wakely finishing 46 not out as he led his side to a fourth win from seven. The defending Champions go second in what is a tight North group, as the competition reaches the halfway point. The top six are separated by just two points but, for Worcs it already looks an uphill battle to quailfy, unable to back up a first win of the campaign on Wednesday night. In his first year in county cricket Gleeson, a late developer at 29, consistently took early wickets, with real pace. Second season syndrome has seem him unable to repeat those feats so far, until this night, although he said afterwards the lack of wickets hadn’t been a concern. “I’m normally not too fused about chasing the wickets, I prefer my economy to be low. I did a bit of work with [coach] Phil Rowe this afternoon. We spoke about Rhythm, run in a bit slower, and I felt like I was getting it through. “I was surprised they got that many after the start they had, but we settled our nerves very quickly with Rosso and Rich with that start. 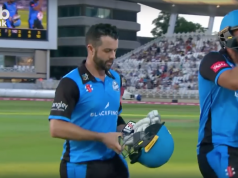 After Gleeson found the inside edge off Clarke in the third over, Cox fell the same way in the fifth, before Hastings was yorked first ball as Worcestershire stuttered for much of the first half of their innings, 66-4 at halfway. Mitch Santner led a slight recovery, hitting three sixes as he shared a stand of 47 with D’Oliveira but he hit Keogh to long-off. The in form Ross Whiteley following for just a single, as he couldn’t back up his six sixes in an over, this time holing out to Wakely on the midwicket boundary. When Kleinveldt removed Joe Leach caught behind first ball, Kleinveldt taking 3-25, the Rapids were 111-7 with four to go and in danger of not batting out their 20. But D’Oliveria, with the help of Ed Barnard, who showed plenty of invention with a 9 ball cameo of 17, took 47 off the final four as Worcs reached a larger than expected total. Levi and Rossington would put the Rapids effort in context, however, as the raced out the box. Levi had a life when he pulled Patrick Brown to Shantry at fine-leg, only for the fielder to go over the rope once taking the catch. The South African inflicted more misery on Shantry, hitting him for a six and three consecutive fours, before Rossington joined in the fun with some lusty straight hitting. He hit five fours and two sixes before Worcs staged a mini fightback after the powerplay, Rossington sweeping Leach to long-on, before Ben Duckett was caught and bowled by Santner for a duck. When Levi slapped Hastings to point, the ball having just been dropped at short third man, the hosts had lost three wickets for 11 runs. But such was the power of the start, the required rate remained less than a run a ball, 59 needed off 60 balls. Wakely instantly eased any nerves, pulling Darryl Mitchell for four and six in the 11th and, from that point, it was a mere formality as the pair cruised the target with little difficult. Keogh was the support act with 22, whilst Wakely hit a further six, before the winning boundary came in the 18th over. The skipper was just four short of 50, but still saw his side back in the mix for quarterfinal qualification.